U.S. officials and lawmakers may have been outraged when Turkish President Recep Tayyip Erdogan’s bodyguards attacked and beat peaceful protesters in Washington as their leader watched. Back in Turkey, however, that hard-line approach is welcomed by many of the president’s nationalist supporters. The clash Tuesday began when Erdogan’s motorcade pulled up in front of the Turkish ambassador’s residence, returning from a visit to the White House and a meeting with President Donald Trump. Erdogan, emerging from his limousine, stood and watched as his guards and supporters began punching and kicking their way through a group of mostly Kurdish protesters across the street. Eleven people were injured. 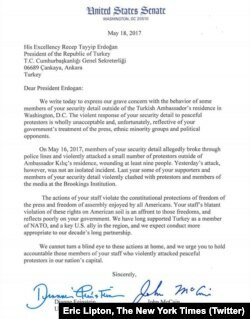 Two U.S. senators protested to Erdogan Thursday about his guards’ behavior. While some Turks also decried the use of force to quash a peaceful protest, calling it a blemish on the country’s international reputation and a violation of free speech, those who support Erdogan’s increasingly authoritarian rule felt it was justified. Yusuf Kanli, a newspaper columnist and political analyst, said no matter how bad it may have looked, the scene played right into Erdogan’s image. Erdogan has bolstered his power base, particularly since a coup attempt last year. He has cracked down hard on dissent, jailing journalists and the leaders and other legislators of the HDP, a Kurdish party that was the second-largest opposition group in Parliament, on allegations of terrorism. The result has been a growing political divide in the country, as shown by results of a referendum last month in which voters narrowly approved even more sweeping powers for Erdogan. A similar clash between Erdogan’s men and protesters broke out a year ago when he visited Washington for a nuclear conference. “Turkish people who support Erdogan’s AK Party see this sort of incident as legitimate,” said Ilhan Tanir, a freelance Turkish journalist and analyst. “Pro-government newspapers and columnists are proof of that. They say they had to teach the PKK terrorists a necessary lesson.